Singapore, Sep 13 (IANS) Halimah Yacob became on Wednesday the first woman President of Singapore, being the only candidate who met the requirements for the presidential elections. However, Yacob’s selection was overshadowed by criticism that it was undemocratic to give her the top post without a vote. 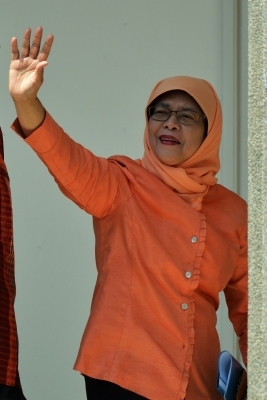 Yacob, a 63-year-old Muslim of Malay descent, will take her oath of office on Thursday in a ceremony due to be held in Istana, the presidential residence and office, Prime Minister Lee Hsien Loong’s office said. Yacob was the only presidential hopeful among three potential candidates to qualify for the post. This year’s election was reserved for Malay candidates. Two other contenders, businessmen Mohamed Salleh Marican and Farid Khan, did not meet one of the minimum requirements to run, Channel NewsAsia reported. Yacob, accompanied by her husband and greeted by about 750 supporters, spoke outside the People’s Association building and called for unity in a speech delivered in English and Malay. In 2016, Singapore’s Parliament approved a constitutional reform which stipulated that the presidential elections would be reserved for one of the ethnicities of the multicultural city-state if no candidate from this group has occupied the post in the previous 30 years. “I am a President for everyone,” said Yacob, whose post is more representative than executive. Yacob was born in 1954 to a Muslim Indian-origin father and a Malay mother. The mother of five started her political career with the People’s Action Party (PAP), which has been governing the country since 1959, and entered the Parliament in 2001. She secured her first portfolio in 2011, as State Minister of Community Development, Youth and Sports, and became the Speaker of Parliament in 2013. In August 2017, she stepped down as Speaker and resigned from the PAP to be able to run for President.